It’s been a frustrating start to the season for Eclipse Motorsport, the #60 TVR T400R seemingly unable to find the pace which so nearly took the team to the 2003 British GT Championship. Struggling for points finishes clearly wasn’t pushing the buttons for the squad and after a frustrating weekend at Snetterton one of the toughest decisions a racing team ever makes was reached. To step back from racing for the Castle Combe rounds and try to discover where the lost pace had gone. A full rebuild of the car found evidence of damage that had lain undiscovered since the 2003 accident and still further problems that had resulted from the accident the car had suffered at Mondello Park. Several small issues had added up to one big one. The rejuvenated T400R tested in the lead-up to the Oulton Park race weekend, the team planning a full day’s track activity. The difference in the car was immediately obvious, both Piers Johnson and Steve Hyde insisting that the car was put away for the day. “Don’t do a thing to it,” said Piers Johnson. It was time to put the car to the ultimate test – against its peers. There was a spring in the step of all the team members at Oulton Park, with the whole paddock glad to see the return of one of the most popular teams in the Championship. “I’ve lost count of the number of people who’ve come and said “Welcome Back today,” said one of the crew. Unable to improve substantially in the restarted session it was a downbeat Hyde that handed the car over to Piers Johnson for the second 15 minutes of qualifying that would determine the grid for Sunday’s race. In a session curtailed to just ten minutes, Piers set the fourth best time, just fractions slower than the Jones brothers’ Porsche. Tenth and fourth would turn out to be so much better than fourth and tenth…. Saturday’s race would prove to be packed with incident from start to finish, and it would end with the strongest possible indication that the team’s preparation had not been in vain. Old Hall corner, turn one at Oulton Park, is often the scene of an accident. If it was on a public road there would doubtless be Gatso cameras and speed humps galore there, but this is racing and speed is what counts. Sadly though for the occupants of six cars their races would either end or at least be seriously curtailed as a result of a multi car shunt on the exit of the sharp right hander. 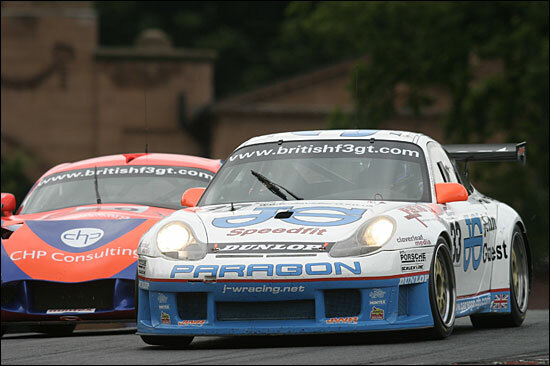 Four cars were out on the spot and both the main title contenders, the GruppeM Porsche and Ferrari 360GTC, would lose a huge chunk of time in rejoining the circuit and having their car’s wounds attended to. 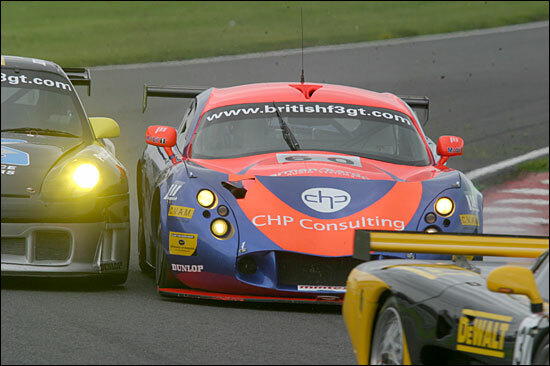 Through it all came a trio of cars battling for the race lead, and third in the close knit chain was Steve Hyde in the Eclipse TVR. He was worrying away at the bootlid of the RSR Racing TVR of Jonathan Coleman, while ahead Mike Jordan in the JWR Porsche tried desperately to shake the pair off, knowing full well that an eight second pit penalty (in line with the classification of both the cars drivers) would need to be counted out by an eight second lead if the team were to have a realistic chance of victory. Coleman was pressing on and the lead was being kept on the wrong side of the line for Jordan’s comfort. 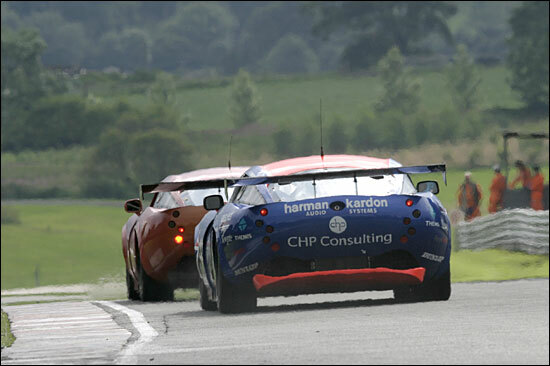 Hyde too was well aware of the game in hand and was pushing the TVR duo onwards towards the pit stop window. Of the trio Hyde was first to stop, Piers Johnson roaring out after an exemplary display of pitwork from John Griffiths and his merry men. Next to stop was the leading JWR car, Mark Sumpter taking over from Jordan. The white Porsche emerged from the pitlane just as Johnson emerged from Old Hall, the Porsche still ahead but with its advantage over the Eclipse car now measured in inches rather than seconds. With new race leader Coleman handing over to Rob Croydon it left Piers Johnson with a clear mission: get by these two cars and the race win was there for the taking. The GruppeM Porsche was way behind, three pitsops to attend to the damage resulting from the first cornr accident ending any thoughts of victory for the team. The Scuderia Ecosse Ferrari though, now in the hands of Andrew Kirkaldy, was charging through the field - surely there was no hope of a podium finish from the car that had rejoined the race stone last? The first issue though would be Johnson’s bid for the race lead. His first step would be to get by the Sumpter Porsche and in a cracking move he did just that, grabbing second place from Sumpter out of Old Hall. Later in the very same lap he went one better, taking the lead from Croydon at Knickerbrook. It was then a relatively straightforward run to the finish, a faultless performance from the whole team netting them a perhaps unexpected but richly deserved first race win of 2004, just seven seconds clear of………… the recovering Ferrari of Kirkaldy, the Scot profiting from both a late race spin from Sumpter and a car destroying accident from the mercifully unhurt Rob Croydon. 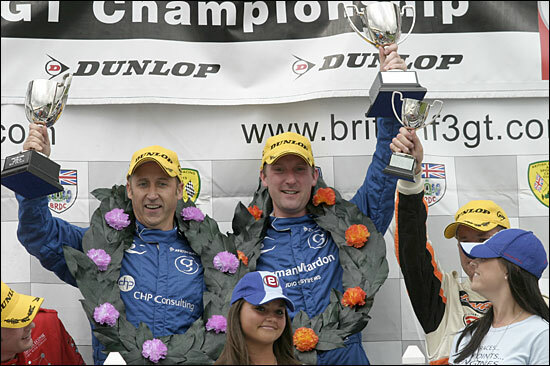 An altogether less eventful race would see the Eclipse crew again return to the podium. 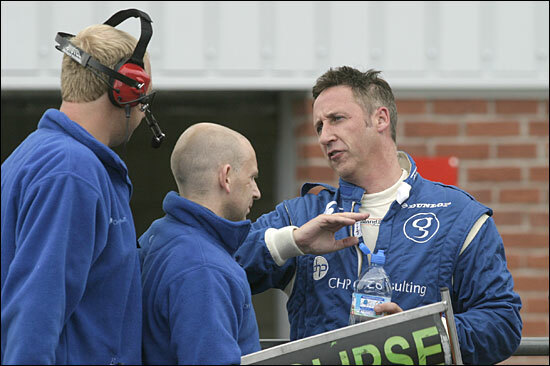 Piers Johnson enjoyed a corking session long battle with the Porsche of Godfrey Jones and the Mosler of Patrick Pearce, with the usual slick pitwork of the Eclipse boys putting Steve Hyde out in a commanding third place, behind the flying 2004 spec Porsche 911 RSR and Ferrari 360 GTC. 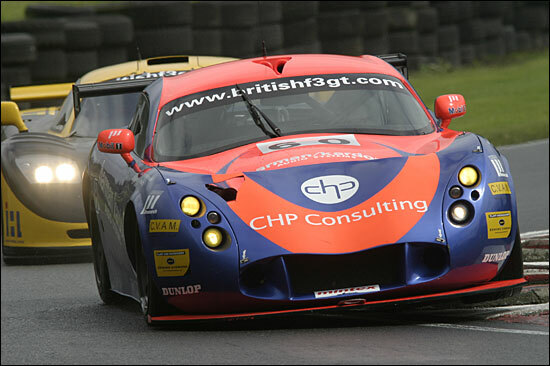 A sensible (but still very quick) pace from Hyde would see the TVR maintain third place, close enough to take advantage of any problem for either (or both!) of the two cars ahead. No such luck this time for Eclipse. Third place though, in the wake of the race win the previous day, would be reason enough to celebrate a fine weekend. Roll On Silverstone – Eclipse are back and eager to revisit the scene of their success last season in claiming the British Empire Trophy at the UK’s Grand Prix venue.